You may have read my most recent post, “I Grow I Cook I Eat I Am”, in which I ruminated on my grandparents’ influence on my personal food culture. In distilling the ways in which cooking makes me “fully alive”, I discovered this fact: when I cook for others, I am “remembering” my community in the way that liturgical acts (the Passover meal, the Christian Eucharist) are “remembrances” of key events in the history of the faith communities that practice them. That is, the faith communities are not simply looking back at past events, but bringing the efficacy of those events into the present. Many Christians do not simply celebrate Eucharist as a memorial reenactment, but as a way of bringing Jesus and his promises into the present moment. [The blogger Frank O’Dea, SSS, gives a good explanation of the theology behind this kind of remembrance here: http://theeucharist.wordpress.com/index/chapter-15-eucharist-as-memorial/%5D. I realized that, when I cook for others, I bring to that process the recipes and techniques that I have been taught by my mother and grandparents, and all the other people who have shared with me their culinary skills and talents and interests. I use cookware and utensils that belonged to my grandparents (My Nana’s wooden spoon and Grandma’s stoneware cookie jar are just two of many dear and useful mementos of my time cooking with them.). And then, there are the memories—sights and sounds, scents, flavors, textures and activities—that are bound up in our family foods and mealtimes. 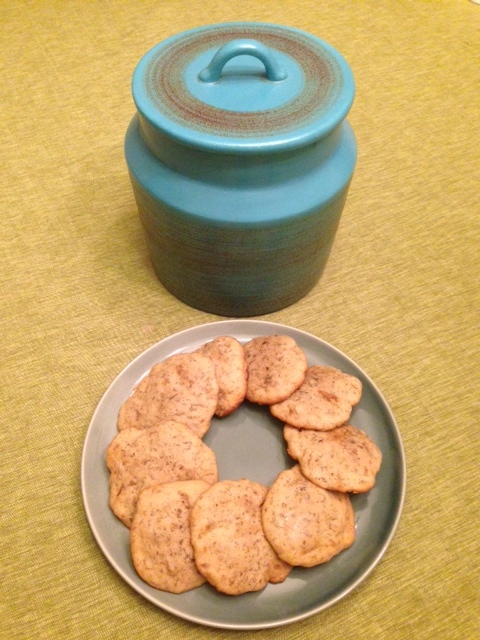 Sharing a meal, or even something as simple as a tin of homemade cookies, with others is a gathering of my community across time and space. It is a spiritual, cosmic event. Through my cooking and baking, I gather beloved ones from my past with those of my present. It is my communion. and will bring them to choir rehearsal on Thursday, I both remember her, and bring her gifts to share with my current community. I am at once both guest and host, as are the recipients, who welcome me and Grandma into their lives through the gift of food. Whoa, no?! And you thought it was just a cookie! I bought these golden carrots at Chicago’s Green City Farmers’ Market yesterday, and crafted this recipe this evening. If you aren’t familiar with Szechuan peppercorns, I commend them to you. They are very fragrant, not very hot, and pair beautifully with citrus. Whatever you do, you absolutely must NOT use fake maple syrup. It is a travesty against nature, and ought to be banned. 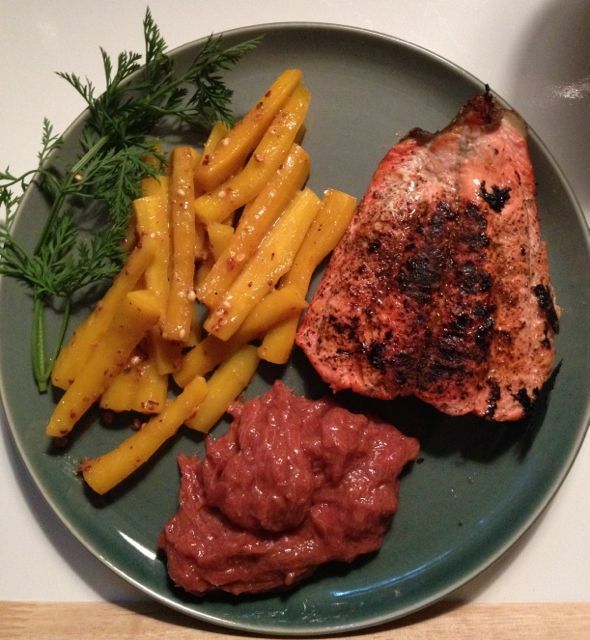 The carrots are plated with wild Alaskan salmon filet seasoned with Penzey’s Bangkok Blend and homemade rhubarb sauce. If you try it, please let me know what you think! fresh parsley, thyme or other herb, chopped, reserving some leaves for garnish. Peel carrots. Cut into 2-3-inch long sections, then halve or quarter to a consistent size. Steam approx. 8 minutes until tender but not soft. Grind peppercorns in a mortar and pestle or a spice grinder. In a skillet or sauté pan (approx. 11″), heat orange juice over medium-high heat, reducing to one half original volume. Add butter, stir in until melted. Add peppercorns, warm gently until thickened and pepper gives of its aroma. Stir carrots into the sauce, and sauté until well covered. Sprinkle on chopped fresh herbs. Serve with herb garnish. 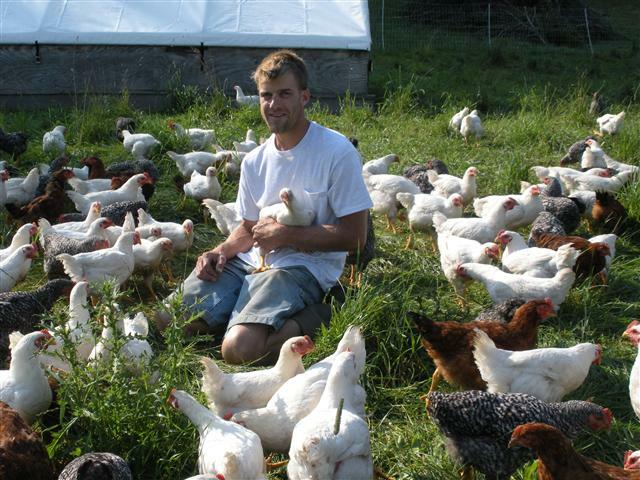 Adam Perrin wants to be your farmer. Hello. I'm Adam Perrin & I Want to Be Your Farmer. Two seasons ago, I bought a dozen eggs at the Hamilton (NY) Farmer’s Market (held on Saturdays and now in its 36th year), for export to Takoma Park, where our Farmers Market’s eggs are always sold out by the time I arrive after church, if I can even get to the market before the 2 PM closing bell. Sunday morning markets are great for Seventh-Day Adventists, thick on the ground in Takoma Park; Roman Catholics, with their Saturday Option; Jews; Muslims; Wiccans; Atheists; Occasional Churchgoers… but not for your garden-variety Professional (read: paid) Protestant, who has to be there every week from before dawn (most of the year, now that Daylight Savings Time has become a farcical eight-month extravaganza, Thank You, George W. Bush and your Republican-controlled Congress and your Skanky Bedmates: Lobbyists for Movie Theaters and Shopping Malls and Big Box Stores, but I don’t want to use up all my blog ideas in one article) through the lunch hour, and on toward mid-afternoon. I opened the paper carton (remember my eggs?) and was taken aback, delighted by subtle color variations among the dozen individuals before me. Each egg was unique; together, they cast a tawny rainbow. Last year, during another of my too-infrequent visits to the Hamilton Farmer’s Market (and to my homeland), I stopped at Quarry Brook Farms’ stand, and was again dazzled by a dozen beautiful eggs, this time artfully, enticingly displayed. I told the tall, thin, bearded young man working the booth that I had previously bought his eggs, and had gotten particular joy out of looking at them, almost to the point of not wanting to eat them. His response was quiet, laconic. (Maybe he thought I was some effete city boy who viewed food as art more than sustenance? Go figure.) He spoke in the local rural accent, the one that first intrigued me, years ago: how can people who live so close to each other, and who interact so much, possess such different inflections? I picked up his business card, and eggs, and moved on through the Market. Back in Maryland, I visited Quarry Brook Farms’ website <http://quarrybrookfarms.com/&gt;, where I found out that Adam Perrin wants to be my farmer. I was pleased to meet online a young, articulate (if a bit taciturn in person) heir to a family farm in our area, who is working to change the terms of family farming in Central New York, an area full of struggling dairy farms, abandoned pastures and hope in short supply for the future of the industry and the culture. Pro-fracking signs seem to be more common on the grassy verge of a farm field than anywhere else in the region. Around the start of Lent, my partner, who’s work has taken him deep into the difficult history of the Holocaust, began reading a troubling book called “Eternal Treblinka: Our Treatment of Animals and the Holocaust” (by Charles Patterson, ), and was moved to keep vegetarian for Lent, later continuing on well past Easter. I returned again to the Hamilton Farmer’s Market in late May, and, drawn back to Adam’s stand by my vivid memory of the beautiful eggs and his website, found myself caught in the collision between supporting Adam’s commitment to organic, humanely raised livestock (by buying some meat) and my ethical failure of eating any meat at all. I took the “low road”, and bought some veal, of all things; Adam cautioned that this wasn’t like supermarket veal, that it wouldn’t be as tender or mild-flavored, that the calves were pastured with their mothers and treated humanely. He said that each year, the cows produced more young than he could keep, and, rather than ship them off to be raised and butchered in the cruel, industrial way, he held onto them until the end of the season, giving them the best short life they could have. But I was still troubled. Back in Maryland again, I e-mailed Adam to ask if, during another trip home, he would meet with me and talk about ethical farming. A trip to Maine always reminds me of my aunt, who first introduced me to some of the best of the Pine Tree State twenty-five years ago. We camped at Camden Hills and wandered the coast from Boothbay to Lubec. Breathtaking scenery, even for a teenager. But since those formative trips, I’ve visited places the family avoided (Shall I name them?). Bar Harbor is one of those places. Actually, on that first rip in August 1986, we detoured through Bar Harbor. Before we crossed into the village, though, we rolled up the windows and locked the doors. We never stopped. We just cruised through, gazing at the touristy shops and the tourists much like rich suburbanites pass cautiously through the ghettos, as if to scare the kids into obedience: “This is what happens to bad teens who drink beer before turning 21…” In our case, it was the fate of those who stayed in city hotels instead of rural motels with asphalt front lawns and “vintage” aluminum deck chairs outside each unit. This time, I found Bar Harbor rather charming, if not yet overrun by summer hoards. Many schools are still in session, or finished yesterday. Even wanderlusty parents couldn’t pack the kids that soon after the final dismissal bell rings. Poppa was a brochure man. He picked up tourist pamphlets all over the place, or sent away for them. Maybe that’s where I got it. I pack too much to read before leaving home, then amass a library of brochures, local weeklies, new books and slick magazines, none of which I ever have time to read, compulsive as I am about exploring from dawn to dark everywhere I go. Today, reading guidebooks and studying maps and looking out over blue water, grey rocks and green hills makes me long to see more, to stay longer. I want to chain myself to a tree in Blue Hill, eating Nervous Nellies Jams & Jellies with my hands, fingers cupped like a primitive spoon for scooping sweet blueberry preserves out of jars and right into my mouth. My sister served steamed lobster and clam chowdah Wednesday night. That was yummo. Last night, we had lobster “subs” at Roy’s in Auburn. Big helping of shredded meat with too much mayo. Described as a sub, I expected lettuce & tomato. My traveling companion asked for coleslaw with his. “We only have fries.” There was — literally — not a single vegetable in the place, except for relish. The clientèle, all locals, looked like they weren’t much for veg. I guess you play to your audience. We had an EXCEPTIONAL meal of local food at Cleonice in Ellsworth last night. The 1930s-era ice-cream parlor has booths with original wooden arches setting each apart like a little room. The long counter is still there, but the shelves are lined with spirits, some of them local, memorable. I plan to slip away today to go up to Bartlett’s Maine Estate Winery in Gouldsboro. That French white oak-aged dry blueberry wine is worth the detour when one is so close already. And now they make brandy. Who has a scheme for how to stay the summer?